Window treatments – that oft overlooked design element – can be hugely impactful to great room design. It tends to be the last thing we think about (much to the room’s detriment!) when we plan our design. Simply put, they’re one of the best ways to help express a unique design aesthetic and punch up the room’s personality. There are tons of reasons to consider your window treatment, but first, please consider The Golden Rule of drape placement. These two windows are exactly the same size, but the window on the right looks much larger. This, my friends is the secret to hanging draperies. Always, always, hang your drapes to the ceiling! Where possible, extend the drapes wider horizontally. This will make so much difference folks! Just say no to bad drape placement. So, what are the advantages of a great window treatment? Practicality. Most people want the option of privacy and the added insulation provided by window treatments. Drama. Nothing says drama like floor-to-ceiling panels of creamy, luxurious fabric, and there is no more obvious way to add airy drama in flash. Personality. Window treatments are just another way to express your design aesthetic and style – pick something fun that complements your design but expresses a different side of your style! Continuity. See how the drapes below really carry the design through the whole room? 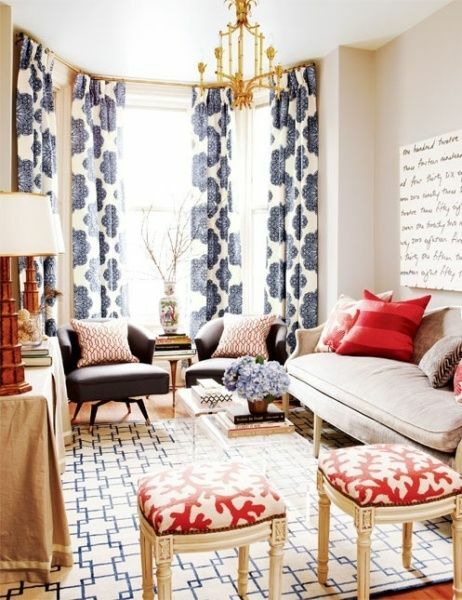 They complement the accent colors, shapes, and patterns, creating a far more cohesive look. Texture. Texture is a great tool to help a design feel more complete – especially if you’re going for a more subtle look, textured window treatments add an extra layer of interest. Pattern. In case you hadn’t noticed, window treatments are a fabulous way to introduce all types of pattern – they cover a ton of surface area, but are an easier and safer way to incorporate pattern than a wallpaper or large furniture piece. Color. 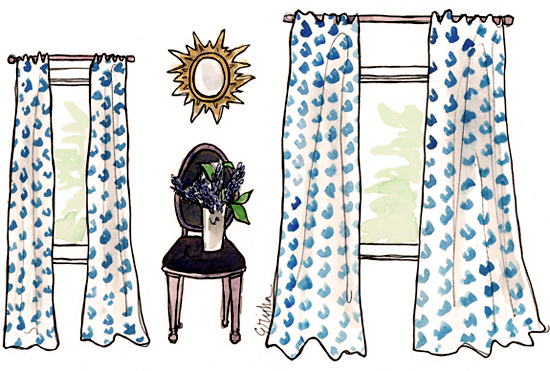 Beautiful bright drapes all but eliminate the need for any other accent color in the room – how easy is that? This entry was posted in Trends by Erisha. Bookmark the permalink. Thanks for the inspiration, it was exactly what I was looking to find. I am moving and decided what to do with my windows to help make my rooms less boring–I am thinking colorful, designer window treatments to help add some life! Glad we could “inspire” you! Good luck with your move! Love these pictures. These shades work great in my office. I wish I had..